A brilliant, sparkling, satisfying meal in a box. Start with cooked brown rice, pearl barley or your favourite grain or pulse. Add anything green - spinach, zucchini, cucumber, spring onions, mint. Then go to town with what's in the garden, the fridge and the cupboard: nuts and seeds, sprouts, dried fruits, red onion, goat's cheese or feta, shredded roast chicken or hot-smoked salmon. Don't skimp on the dressing - you really need it to give it all a zing. Toast the sunflower, pumpkin seeds, almonds and pistachios in a hot dry pan for a minute or two. Wash the sprouts and shake dry. 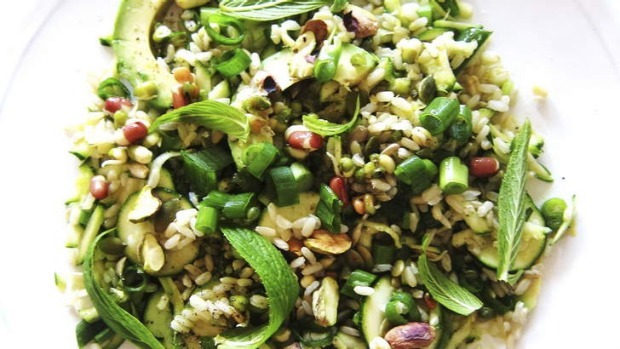 Combine the brown rice (or your grain / pulse of choice) zucchini, avocado, sprouts, spring onions, sunflower seeds, pumpkin seeds, almonds, pistachios and mint, season generously with sea salt and pepper, then lightly toss. Keep the dressing ingredients in small lidded jar/s to shake and add on the spot.